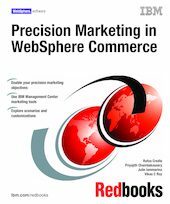 This IBM® Redbooks® publication positions WebSphere® Commerce Version 7 in today’s marketplace and discusses its enhanced features enabling business users to achieve their vision for precision marketing. This book helps you to tailor and configure the Marketing tool in IBM Management Center for WebSphere Commerce to create and manage various promotion campaigns as needed by your business. This book provides several business scenarios which can be implemented through simple customizations. Each scenario addresses a unique requirement which can be mapped with similar business scenarios. This book has been developed for an experienced WebSphere Commerce design and developers audience.